In my previous post you learned that the U.S. Department of Energy Solar Decathlon is an award-winning program that challenges 20 collegiate teams from around the world to design, build and operate solar-powered houses that are cost-effective, energy-efficient and attractive. The houses are built over a two year period on collegiate campuses across the world, and are then shipped to their current location at Orange County Great Park in Irvine, California for public display throughout the duration of the event. The competition itself consists of 10 contests. One of the ten contests, the Energy Balance Contest , measures the net energy each of the houses produce and consume during the competition. A team receives full points for achieving a net energy consumption of zero, thus producing more energy than the house consumes. One of the most important aspects in judging the Energy Balance Contest is the micro-grid solution — the connection between the houses and the local utility to provide excess solar energy to the grid. Throughout the competition, each team’s house will be equipped with a bidirectional utility meter that enables power flow to and from the electrical utility. In addition to the utility-supplied net energy meters at each house, a net metering display system will be installed to measure and record energy consumption and PV energy production at each house. In more simple terms, here is how it works. When the sun shines, the house’s PV system produces electricity. Any excess electricity that the house does not use flows back through the meter to the grid. At night, when the house is consuming electricity from running appliances, the house consumes electricity from the grid and the meter will run forward. In order to achieve a meter reading of zero, the house must produce as much energy as the house consumes during the competition. We are already a few days into the competition and the event is just starting to heat up. After speaking with a few of the teams, students are hoping for a few more sunny California days so that their houses can produce enough energy to win the Energy Balance Contest. The winner of the competition will be announced on October 12th at 10:00 a.m., so please feel free to follow us on twitter @SchneiderNA for a live announcement of the winning house. 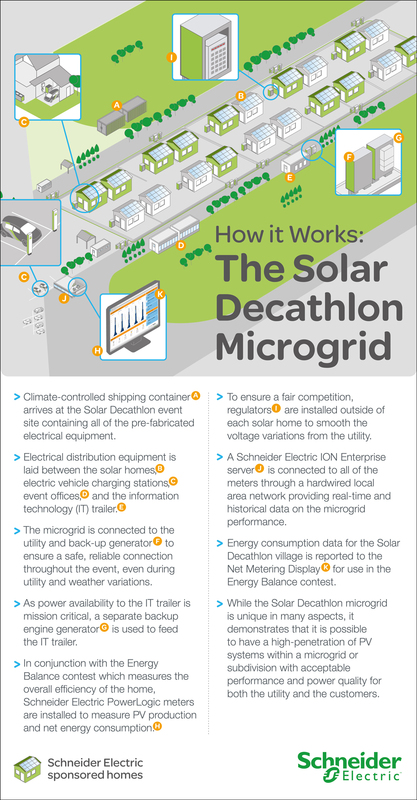 Whether you are on site of the competition or not, the below infographic will tell you exactly how the Solar Decathlon Microgrid solution works. the micro grid for Solar decathlon in Irvine is a great solution for making people aware of what is at stake with the Solar Village: contributing to solve the energy dilemma. 600 students have worked hard over the last 2 years to create energy positive houses. The micro grid is allowing to give back to the utility the excess of energy and the display is allowing to visualize it at Village level. Therefore you make people aware of what is going on, as you measure and display the information. Then an interaction between consumers and the utility will happen, allowing to save energy, typically 30% of the energy consumed.In fact, you bring intelligence to a grid, i.e. to energy, creating Intelligent Energy! A popular way to name this today is to refer to a Smart Grid! This is what Schneider Electric is doing at Solar decathlon, showcasing the 1st step of a Smart Grid at the level of a 600 people Village ! To date the houses have produced 3,785 kWh of energy! These are great ideas, and there could be potentially signifcant markets in Asian cities, as more and more leaders look for ways of creating slum free, green cities, while taking advantage of the various national government subsidies being offered for renewable energy generation.